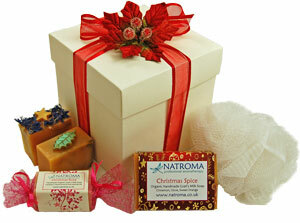 This year, our Christmas Gift Hampers can be found on our Natroma website - please visit our Natroma Christmas Gifts page. Our Christmas gift ideas include Festive Bath Bombs, hand decorated mini goats milk soap slices and organic Fizzing Butter Melts.We present our natural skincare goodies in gorgeous hamper boxes nestled in shredded tissue paper, and elegantly wrapped with pretty ribbons and festive decorations. 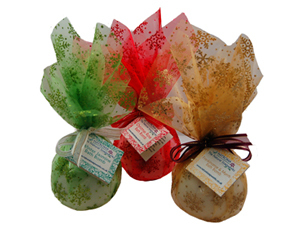 Includes Special Edition larger bath bombs (weighing at least 140g) available in 4 luxury fragrances - Frankincense and Myrrh (gold packaging), DeStress (green packaging), Relax (silver packaging) and Happy Christmas (red packaging). Order via the Natroma website. presented in a snowflake decorated luxury organza wrapping. 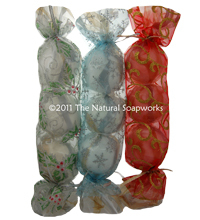 Includes 3 organic 25g mini soap bars - Frankincense and Myrrh, Winter Wonderland and Christmas Spice. Please order via the Natroma website. presented in a 120 x 45 x 70mm recycled ribbed mini handbag box with grosgrain ribbon and holly decoration. Includes a lovely variety of bath bomb products. Each cracker contains a bath bomb, a butter bomb and a petal bomb for luxurious aromatherapy bathing. Available in 3 festive colours - red and gold (Happy Christmas), blue with silver snowflake (Relax) or green and red holly (DeStress) so please mention if you have a preference at the checkout. Please order via the Natroma website. presented in a organza wrapped cracker over cellophane wrapper. 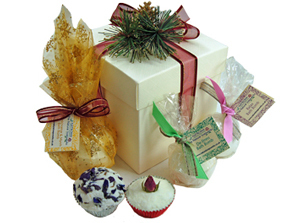 Includes a Festive Bath Bomb, 2 organic Fizzing Butter Melts and 2 bath bombs. Perfect for relaxing after Christmas! Order via the Natroma website. presented in a 140 x 100 x 90mm recycled ribbed hamper box decorated with a festive decoration. 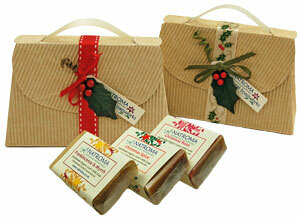 Includes a 24g mini organic Christmas soap bar, 30-35g hand decorated soap slice, an organic fizzing butter melt. and a fair trade candle. 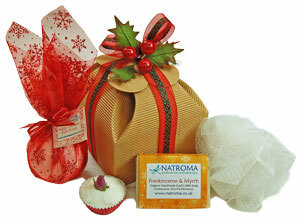 Please order via the Natroma website presented in a 100 x 100 x 60mm ivory lidded hamper box with a festive decoration. 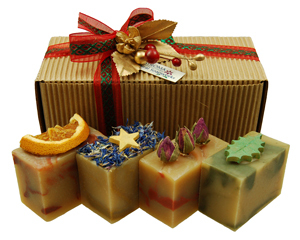 Includes 4 hand decorated soap slices in four festive fragrances - Frankincense and Myrrh, Christmas Spice, Christmas Rose and Christmas Tree presented in a 140 x 60 x 70 mm recycled ribbed hamper box decorated with a festive decoration. 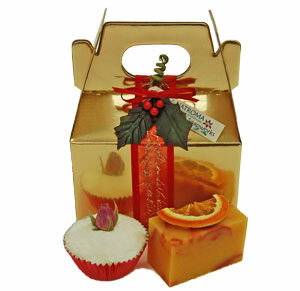 Includes an organic fizzing bath melt and a hand decorated soap - great as a small Secret Santa gift. Please order via the Natroma website. presented in a 100 x 65 x 130 mm golden gable hamper with a festive decoration. 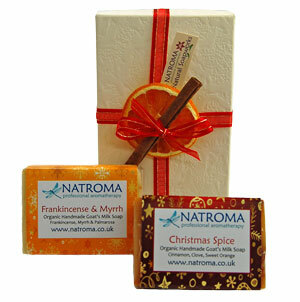 Includes 2 organic goats milk soaps in Frankincense and Myrrh and Christmas Spice presented in a 130 x 90 x 40 mm ivory hamper decorated with organza ribbon, an orange slice and a cinnamon stick. Includes selection of soaps - full sized Christmas soap, 2 hand decorated soap slices and a soap cracker with a bath scrunchie. 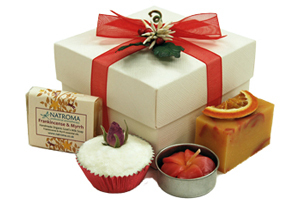 Please order via the Natroma website presented in a 120 x 120 x 120mm ivory hamper decorated with red organza ribbon and a poinsettia decoration. Includes a 70g hand decorated organic Frankincense and Myrrh soap, a 100g organic Christmas soap bar, a large Festive Bath Bomb and an organic Fizzing Butter Melt. The natural fragrances in this hamper will vary, to allow gift recipients the chance to try a number of aromatherapy aromas. presented in a 120 x 120 x 120mm unusual fluted hamper box decorated with red and green organza ribbon and a festive decoration.